The index opened flat and stayed in narrow range but saw huge unwinding towards the end of the day to close weak at 7749.70, loss of 33.70 points. The broader market was weak with 455 advances to 1107 declines. Range for the series is at 7500-8000. Call option 7700-7900 added 13.38 lacs OI with profit booking at 8000 and above strike prices. 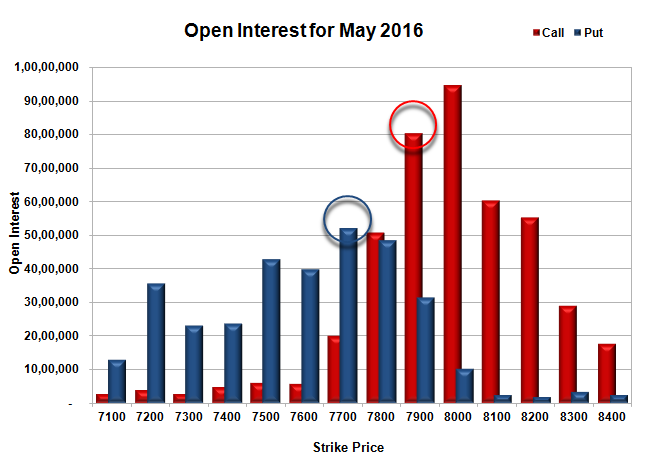 Put option 7600 added 2.46 lacs OI with short covering at 7800 and above strike prices. 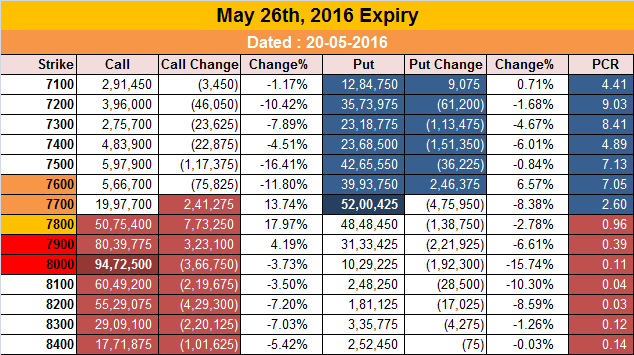 Nifty Open Interest is at 1,56,25,950 down by 8,73,450, with decrease in price, probably long liquidation. Bank Nifty Open Interest is at 16,54,740 down by 75,540, with decrease in price, probably long liquidation. FII’s sold 751 contracts of Index Futures, which includes net 4141 contracts long liquidation and 3390 contracts short covering, with decrease in net OI by 7531 contracts, includes 25706 longs to 26457 shorts for the day. FII’s Index future open contract as on date is 138707 Longs to 125758 Shorts, Net 12949 down by 751 contracts. Initial and best support still at 7700, with OI of 52.00 lacs and below that at 7600 with OI of 39.94 lacs. 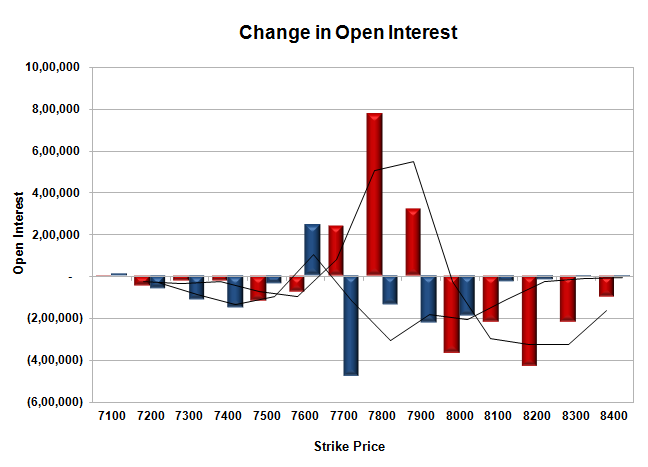 Initial resistance at 7800, with OI of 50.75 lacs and above that at 7900 with OI of 80.40 lacs. 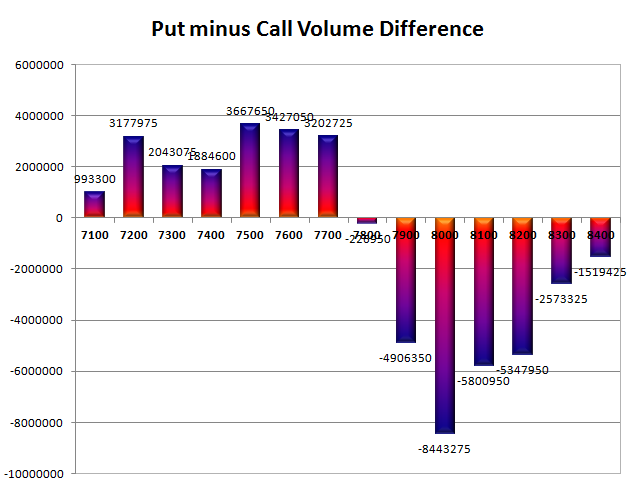 Day Range as per Option Table is 7696 - 7829 and as per VIX is 7683 - 7816 with 7766 as the Pivot.